Make of it what you will but there has to be something in the fact that this film received a second viewing! Having purchased it from my local bargain DVD shop some years ago for a huge £1.99, I found myself giving it further scrutiny. My belief is that you can never fully appreciate any film until you have seen it for a second or sometimes even a third time. However that logic can go out the window with some of the films I watch. However you look at it, Hell Asylum was in my eyes at least good enough to warrant this immense honour. I suppose it was the sight of Joe Estevez in the opening scene that triggers something in your mind that says “It can’t be that bad, that’s Martin Sheen’s little bro!” A quick visit to IMDB finds my staring at a long list of “random” horror films. It is his known for films that include Soultaker, Beach Babes from Beyond, San Franpsycho and Death Row which really puts pain to my statement! But... There is a silver lining. My Estevez is on screen for approximately 5 minutes, right at the beginning and right at the end. What happens in the middle is actually really good! The character build up is very good. A reality TV style introduction gives us all the information we need to know about the characters. Not drawn out and boring, just straight to the point and insightful. I am not quite sure about the producer Max’s back story for the haunted house. It says the house was built in 1850 and turned into a sanatorium at the turn of the century, firstly not very original (thoughts of The Haunting and House on Haunted Hill) and secondly that house looks like a hospital from the 1950’s rather than 1850’s but I will give them the benefit of the doubt this time! The term over the top take on new meaning with some of the acting in this film but some performances do help claw back some credibility, most notably Sunny Lombardo (Rainbow). With the exception of Debra Mayer (Paige Turner) the cast are not too bad. Sorry to say that Mayer’s performance is bordering on dire which considering she is the first billed begs the question, why? The special effects in Hell Asylum range in their quality. Some very good imagery leads to some poor anatomical effects. I am not quite sure what was being pulled out of the dead people, maybe Spaghetti or something but plenty of blood to try and hide the whole thing does seem to work. Some poor “whooshing” sound effects and the music sometimes drowned out the dialogue but the music used was quite good. The overall production value is quite shoddy, understandably the headset mounted “cam” shots are supposed to be quite poor to be realistic but they should have spent a little bit more on equipment and bit less on casting Martin Sheen’s brother! 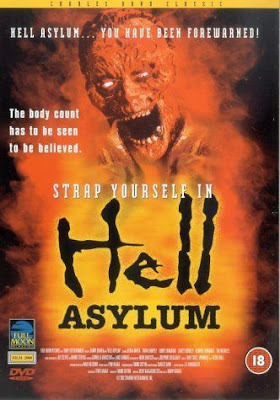 Although Hell Asylum weaves its way through a fairly unoriginal story, it is definitely one of my little gems and well deserving of its second viewing. If you approach your films the same way I do, I would definitely recommend to anyone as one to watch and hopefully you will enjoy it too.